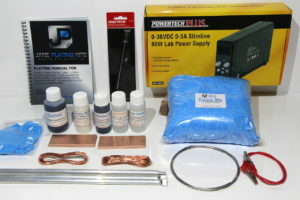 Jane Kits Electroforming Copper Kits includes all items necessary to successfully conduct your own Electroforming. Electroforming is the process of controlling the metal deposit from an anode metal, through electrolyte solution, onto an electro conductive surface. Basically, a skin of metal is built up, over the applied Conductive Paint, into a rigid structure. This kit contains various items including; A liquid Sealer, Conductive Paint for applying to non-conductive surfaces and Copper plating chemicals for applying the base metal to the conductive paint. It also includes the Antiquing Patina solution to assist in producing the ultimate patina look and the Clear Shield – Clear Thermoplastic Acrylic Lacquer to lock in the desired look and seal and protect the finished items. Electroforming opens a world of plating opportunities. With the correct preparation, almost anything can be Electroformed. Organic items such as leaves, cones, nuts, pods etc. can be transformed into decretive items for jewellery or trinkets. The list is endless; shells, rocks, gems, wax, plastic, rubber, fabric etc. etc. etc. The process varies slightly depending on the object you wish to plate. Most items will require an initial sealer to be applied prior to the conductive paint. When these initial steps are done successfully the object is wired up to go into the copper plating bath. This is where the fun begins. Within minutes a thin coverage of Copper plate will coat you object. The longer it is in the bath the thicker the coat of Copper will be deposited. Once you are happy with the thickness and coverage of the Copper coating, the item is removed and prepared for the final stages. The final stages may vary depending on the desired finish. You can patina your item, using the Antiquing Patina solution provided in the Kit, you can carefully polish the Copper or you can just lacquer it using the Clear Shield Lacquer, also provided in the Kit. You may also choose to just let nature have its way with it and let the surface of the object find its own destiny. The items can also be further plated using Jane Kits other plating options. If you want to add a silver look to your items, you can Nickel Electroplate, Electroless Nickel or even Zinc Electroplate them. You can even add a 24 Carat Gold plate. These options can be purchased through Jane Kits website. The initial stages include the application of the sealer and conductive paint. Once these stages are completed, the object moves into the Copper Plating bath. The Copper bath and procedures are very similar to the standard Copper Electroplating procedures used on metallic surfaces. The Copper bath is an Acid Copper bath and is in fact the same Copper bath used for both. 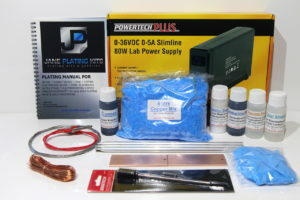 Electroforming Copper Kits contains an Acid Copper plating electrolyte. It is supplied in crystal form to be mixed with water as per the instructions to make up a sulphate copper plating bath. Although it is an ACID Copper mix, unlike other mixes for sale on the market our Acid Copper mix does not require you to source or add any dangerous Acids to the bath. The entire mix will arrive to you from us ready to mix with water. The bath is easy to use and will produce a ductile bright copper plate. The bath has excellent levelling qualities and is easy to control. The deposition rate of the bath under normal conditions is one thousandth of an inch per hour. This will vary dramatically due to the variants in the conductivity of the object you are plating. There is no recommended time for parts to be in the copper plating bath. Generally, the plating is looked at in three stages. Stage 1, includes creating a complete layer of copper over the entire object. The amount of time required to complete this will vary depending on the material, the size of the object and how it is attached to the current via the copper wire connection. During this stage the amount of current (Amps) required will often be more than in Stage 2. Once you have a complete skin of Copper plate over the object you can move onto Stage 2. Stage 2, includes the continuation of the Copper plate over the object. The thickness required will depend on the individual requirements. The longer it is in the Copper bath, the more will plate onto it and the thicker the skin or coat of Copper will become. It is not unusual for objects to be left in the Copper bath for many hours. The current (Amps) required during this stage is generally less than Stage 1. Periodic checking for a smooth clean coat of Copper on the object will help determine the correct current of Amps required. Stage 3, is basically the final minutes of Copper plating. Due to the nature of the Electroforming Copper plating procedure eating through the Cumac (copper brightener) quickly, the general rule is to plate you objects for the length of time required without topping up the Cumac in the bath. This will plate a dull salmon colour on the object, which is perfectly fine for build up of Copper plate but does not look desirable. To achieve the bright Copper finish requires the addition of more of the Cumac (copper brightener) to be added to the bath. Once this has been added and circulated, place you objects back into the bath for a final coat for 5 to 10 minutes. This will produce a bright Copper finish and complete the Copper plating process. The Copper Plating bath is a room temperature bath which should be operated at a temperature of 24 to 32 degrees Celsius to achieve the best results. The bath will not plate at a temperature of 15 degrees Celsius or lower. This is because the electrical current that is required to flow through the electrolyte to carry the ions of metal from the anodes hanging in the bath to the plating work (cathode) do not travel well through a cold bath. The copper anodes hanging in the plating bath are the source of the copper metal that will be plated on to your work hanging in the plating electrolyte. The minute ions of copper metal are transferred from the copper anodes hanging in the bath by means of the electrical current to the plating work hanging in the bath (the cathode/s). The recommended temperature of the Copper bath is 24 to 32 degrees Celsius. During trials of the bath it was found that the bath produced the best results at the higher end of the temperature range. Acid Copper will not plate directly onto any objects without a conductive layer. If you are attempting to Copper plate metallic surfaces, then you will not be able to use the conductive paint. The conductive paint is designed for Electroforming only. Acid Copper will not plate directly onto iron, steel, alloys, or on to die castings. To plate ferrous metals such as iron or steel in Acid Copper will require you applying a Nickel Strike. This can be achieved by either using Jane Kits Nickel Electroplating procedure or Jane Kits Electroless Nickel Plating procedure. 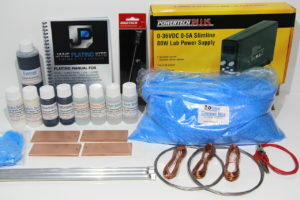 (see Electroplating Kits or Electroless Nickel on the Jane Kits Home Page for more information). A 10 minute Nickel or Electroless Nickle strike is all that is required prior to Acid Copper Electroplating onto iron or steel parts. When the Copper layer is completed you can choose to finish your product in several ways or even electroplate other metals over the top. The Electroforming Copper Kit includes an Antiquing Patina solution that will provide a patina look if you desire. The Kit also includes a Clear Shield Lacquer that can be applied over the top of any finish you desire. Jane Kits also sell Nickel Electroplating and Gold Plating Kits that can be purchased to further enhance the look of your Electroformed items. See more information on these and other plating options in the Electroplating Kits category on the Home Page. The bottle of Cumac is used as a copper brightener and is added initially at the rate of 5 ml per litre of bath size. It is then added as you go when the brightness of the Copper bath diminishes. Due to the nature of the Electroforming Copper plating procedure eating through the Cumac (copper brightener) quickly, the general rule is to plate you objects for the length of time required without topping up the Cumac in the bath. This will plate a dull salmon colour on the object, which is perfectly fine for build up of Copper plate but does not look desirable. To achieve the bright Copper finish requires the addition of more of the Cumac (copper brightener) to be added to the bath. Once this has been added and circulated, place you objects back into the bath for a final coat for 5 to 10 minutes. This will produce a bright Copper finish and complete the Copper plating process. Electroforming Copper opens a world of plating opportunities. With the correct preparation, almost anything can be Electroformed. Organic items such as leaves, cones, nuts, pods etc. can be transformed into decretive items for jewellery or trinkets. The list is endless; shells, rocks, gems, wax, plastic, rubber, fabric etc. etc. etc.